It isn't difficult to maintain the softness and fluffiness of towels. Maintain new towels so they don't become stiff and revive older towels using several remedies. Soap residue is the main reason towels lose their softness. If you want to keep new towels fluffy or you've noticed your old towels have become stiff and are no longer soft, the first thing to consider is the accumulation of detergent trapped within the towel fibers. This residue is compounded by the use of softeners. When you wash your new towels, reduce the amount you normally use in a load to maintain the towels' softness. If your towels are all ready stiff, cut back on the amount you have been using. 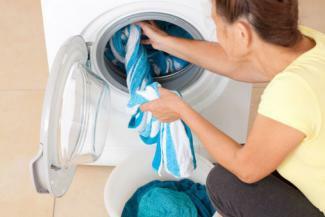 Over time, if you continue to use less detergent, much of the residue will be washed out of the towel fibers. If this doesn't remedy the stiffness in the towels, there are a few other things you can try. Don't wash new towels in cold or lukewarm water. 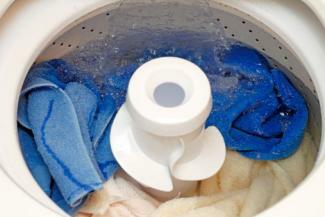 Cold water makes it very difficult for the detergent to break down and be absorbed by the water. When you wash towels in cold water, the detergent is absorbed by the fibers in the towel instead of mixing with the water. The detergent then settles into the fibers and proceeds to set by the heat from the dryer. The heat set detergent then makes the towel fibers stiff. The next cold water or lukewarm wash adds more heat-set detergent and so on. Warm or hot water are the ideal temperatures needed to break down the detergent for proper cleaning. Some people will only use hot water for towels and even forego warm water. They believe that the hot water temperature is the only way for the detergent to mix completely with the water. The hot temperature makes the detergent cleaning properties active and more effective in loosening up dirt and grim trapped in the towel fibers. Wash new towels in hot water and maintain them by continuing this throughout the towels' lives. If your towels are old and stiff, switch to using hot water if you've been using cold. Another way to beat the detergent problem is to allow the washer to fill with water before loading the towels. Once the washer is half full, manually add the detergent to allow it time to dissolve. Once the washer is filled, place the load of towels into the washing machine. This will ensure that the detergent isn't absorbed by the towel fabric. If you reduce the amount of detergent you use but your towels are still coming out stiff, there's a another possible culprit - fabric softener. As strange as it sounds, softeners alone can cause stiffness in towels. There is a simple cause found within most softeners: silicone. Silicone-based compounds that are included in fabric softeners are added as a way to make the towel fibers bind easier with the softener. Unfortunately, over time, softeners containing this element can actually make fabrics repel water. This small trick can restore softness to towels that have accumulated with softener residue, robbing the fibers of their natural softness. Substitute the softener every few weeks with a cup of distilled white vinegar. Begin this cycle with new towels to maintain their softness and incorporate it into your wash schedule with old ones, too. Another way to use white vinegar is to wash the towels a second time, only without using any detergent. Instead, only use vinegar. Add two cups of distilled white vinegar for the second complete wash cycle. One or both of these steps should resolve the stiffness in your towels. However, if your towels are still stiff, you may need to add one final ingredient - baking soda. Sometimes the accumulated residue from detergent and softener is difficult to cut through. If you've tried all these tips and still have an issue, it's time to break out the baking soda. 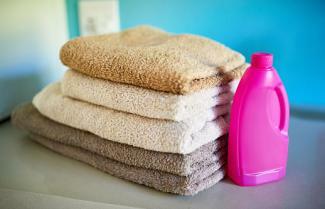 Add one cup of baking soda when you wash a load of towels. Add the baking soda to the detergent amount you ordinarily use. If you feel your towels need a more aggressive approach to reconstitute them to their original softness, you can use the vinegar wash immediately followed by a second wash of one cup of baking soda. Wash with half the normal amount of detergent. This method will ensure that all chemical residue buildup is loosened from the fabric and your towels should come out softer. 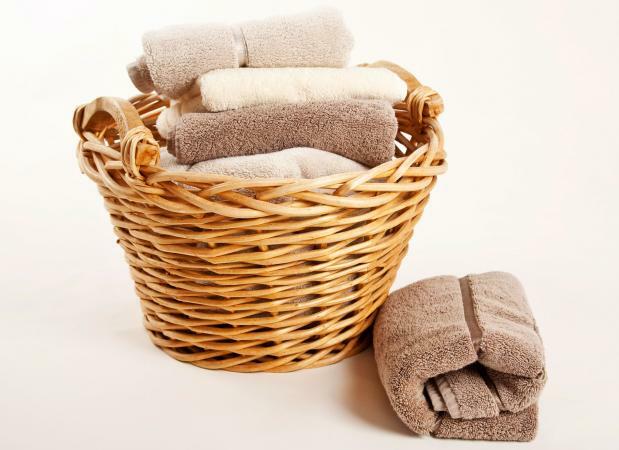 There are a few things you should do to ensure all your efforts to maintain or restore softness and fluffiness to your towels are successful. Don't add non-towel items to the washer load. If you overload the washer with too many towels, the soap cannot adequately be rinsed away. This creates a residue buildup that will carry over to the next wash. If you continually overload the washing machine, it's only a matter of time before the towels become stiff. At the end of the wash cycle, shake out the towels to loosen the wet fibers so they will dry easier and the fiber loops aren't matted down. Shake each towel a couple of times before tossing into the dryer. The dryer can contribute to making your towels stiff. There are a few things you can do to eliminate this as an issue. Don't overload the dryer or the towels won't have enough room for the air to reach the towels to fluff the fabric. Use fewer towels in a load to prevent overloading. Toss in a clean tennis ball or two to further loosen the towel fibers. Use a low heat or tumble setting when using tennis balls. Make sure towels are thoroughly dry before removing from the dryer. Once your towels have undergone washing and drying, the last step to keeping them soft and fluffy is how they are prepared for the linen closet and bathroom shelves. Remove towels immediately at end of drying cycle. Shake out the towels to keep them fluffy as the fibers cool. Don't cram and pack too many towels onto each other on bathroom shelves and linen closets. Fold the towels the way a hotel does - in thirds (fold length in half, fold in half again by taking the bottom of towel and fold to the top, and then fold into thirds). It doesn't take a lot of time to care for towels. If you follow some or all of these steps, you can ensure your towels last a long time and retain that nice soft and fluffy feel every time they're used.